Increasing numbers of people have access to fast internet connections, high-speed devices and gapless net coverage. This is especially true for developers, but this remains a luxury that's out of reach for many. This blog post is for all your users who live in remote areas, or simply for those who access the internet in limited connectivity areas like the subway. Loading websites in non-ideal situations can be very painful and lead to a high rate of user loss. I want to introduce a sparsely-used technique that has been around for a while, along with an extra-modern goodie which makes the loading process both painless and aesthetically pleasing. By embedding previews of relevant images, we ensure that the page layout receives a final structure as early as possible for the benefit of the user. Our goal is to avoid losing a user’s attention by optimizing our critical page render path. You can learn even more about this in Understanding the critical rendering path, rendering pages in 1 second by Luis Vieira. The following situation is all too familiar. A page loads and proceeds to jump around as images slowly finish loading. The final layout is not predictable for the human eye and the readability of the site is poor until all the images are loaded. 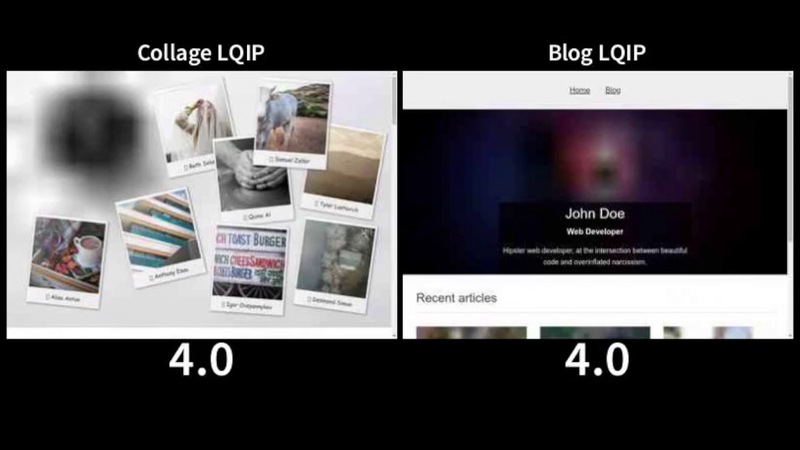 Instead of having blank spaces in place of images, LQIP ensures that low-quality previews of images are embedded in their eventual positions. This way, users can get an idea of the content of the image before it loads. This was already introduced by Guy Podjarny (Guypo) in 2013 in 2013") but has had a low adoption rate, likely due to a lack of research data about user loss in relation to slow-loading pages. 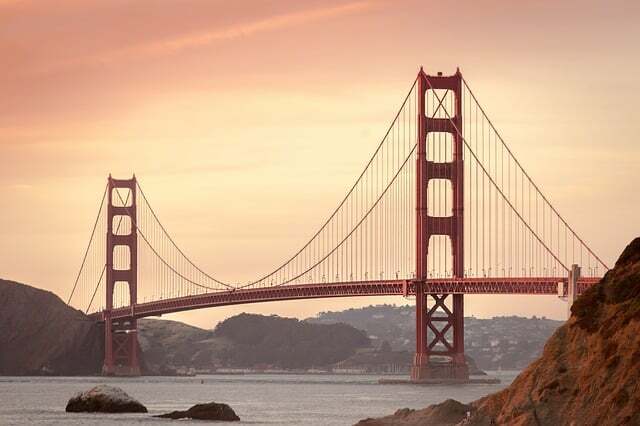 Facebook went a step further by using the same file header for all images and only sending the actual image data. Their 42 x 42 px previews went all the way down to 200 bytes! 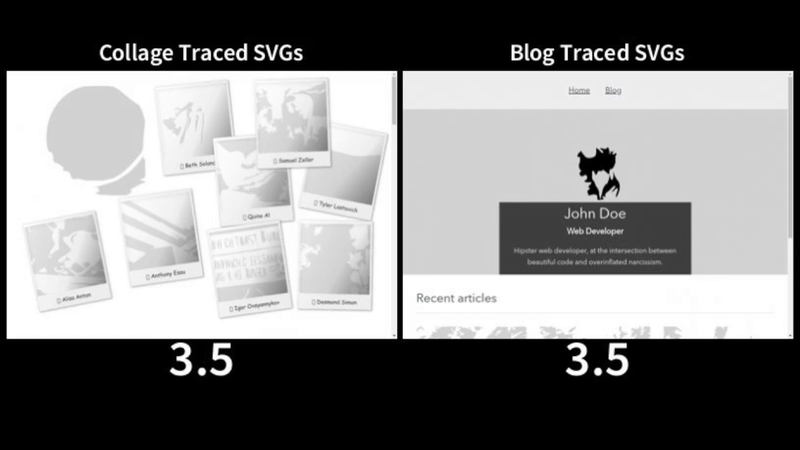 Instead of having small and blurry previews, this technique uses Potrace to create a traced SVG version of an image. 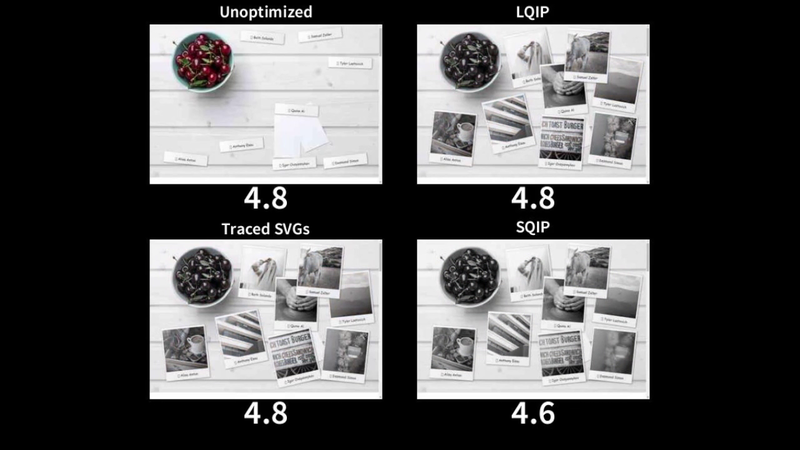 While the results are very exact and look fantastic, there is a huge downside: Depending on the detail of the source image, the file size per image may get 3 times as big compared to other techniques, even with SVGO optimizations and HTTP compression enabled. Let’s get fancy. This technique offers a unique, modernistic preview style while achieving file size and compression possibilities very close to the original LQIP technique. By combining primitive SVG shapes like triangles, circles, polygons and more, we generate vectorized primitive version of our images. This is achieved by the wonderful SQIP project by Tobias Baldauf, which in turn is based on the Primitive Pictures Go Tool by Michael Fogleman. I am very proud that I could help evolve and implement this technique into the fantastic Gatsby static site generator. Adding it to your website project should take only a few minutes. The plugin offers a wide variation of configurations like blur factor, number of shapes, type of shapes, and more, leaving a lot of room for artistic freedom. In the future, I plan to contribute faux-loading animations and more via a plugin system for node-sqip. The maximum size of your previews really depends on your current HTML payload size and personal limits. Generally, I’d say you should go as small as possible, though the 200 byte limit Facebook has given themselves is slightly too ambitious. For frequent previews, like article teasers or image gallery thumbnails, I’d recommend 15-25 shapes or header images. You may go up to 50-200 shapes and, depending on your available file size, you may fill up to the point of reaching the next TCP window. There is more on this in the next section. I did extended research on how much shape count, shape type and other factors impact your HTML payload size. 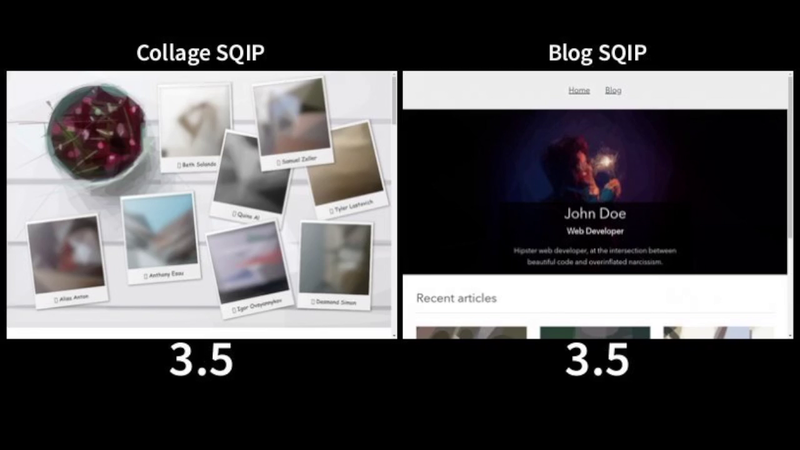 SQIP is very performance hungry: make sure to cache your generated SQIPs for subsequent builds. Your HTML payload size is the total size of your initial HTTP HTML request. It is the one that happens right after the user opens your website. This data should be as small as possible. Luckily gzip & brotli compression help us a lot over here, so make sure it is enabled on your web server. A TCP round trip will normally have 14 kb available. 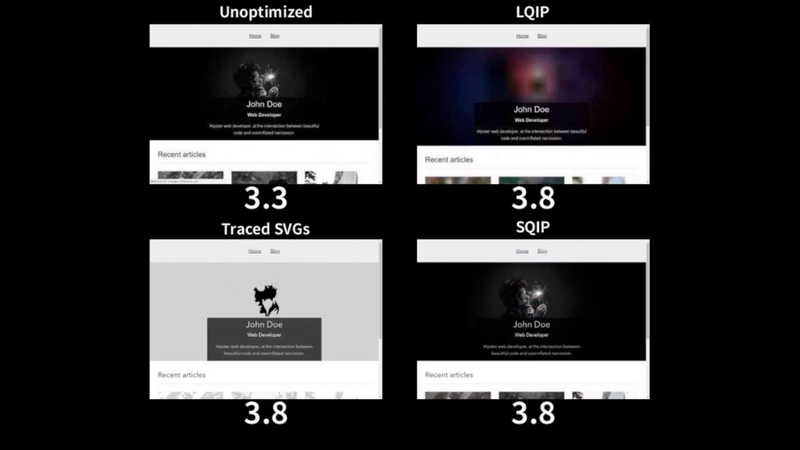 With a reasonable amount of header data, you can assume that you have 10 kb for your HTML response and your previews. This assumes a initial congestion window of 10 packets of 1,500 bytes each, plus around 100 bytes of IP & TCP headers. The congestion window grows after the first round trip, which means you can fit a lot more content into two round trips. The growth varies by TCP implementation and operating system, but you can assume that it's around double the previous number - so 28kB. This totals to 42kB for two round trips. So the rough HTML response size milestones, excluding headers, are: 10 kb, 38 kb, 94 kb, 206 kb, and so on. This means everytime you exceed one of these size milestones, your page takes at least one more TCP round trip longer to load (actual download time + user ping). 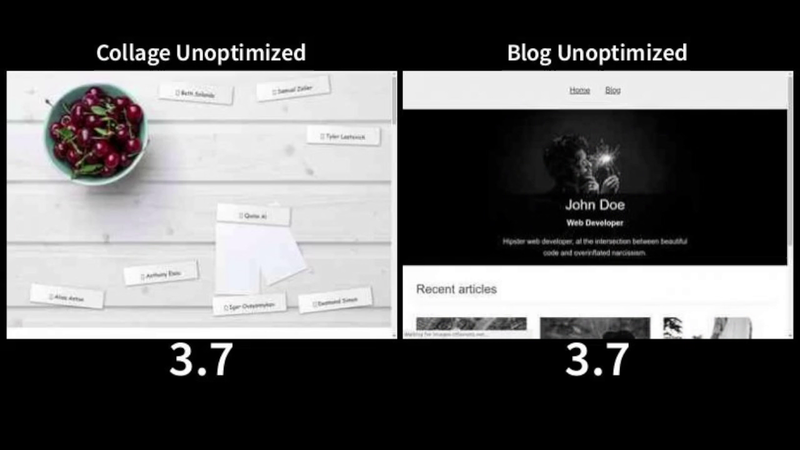 So, keep your HTML as small as possible and use webpagetest.org to measure the impact of your optimizations. Your goal is to achieve a faster time to first paint, not a slowdown of the entire loading process. For an even more in-depth look at this topic, check out Simon Hearne’s work or do some exploratory googling. Write a tool for Node, Webpack or Gatsby which checks your payload size and tells you how many TCP round trips your site needs to load.